Simple prototype level created while I was on the project. 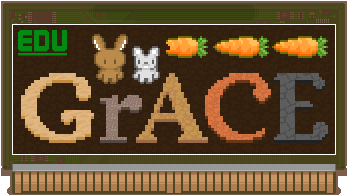 GrACE (or the Gram’s House Automated Content Engine) is a National Science Foundation-funded collaborative project I worked on as part of my co-op at Northeastern University Game Studio. It’s an educational game that uses procedural content generation to create puzzles whose solutions are equivalent to the computer science concept of constructing a minimum spanning tree. In this metaphor, the players lay out paths to holes where seeds are planted, and then let the water flow to the seeds by pulling out a giant cork. Conserving the limited water by using the most efficient path rewards the characters with more food. GrACE is played in a collaborative environment to see how players communicate about solving computer science problems. GrACE is intended to be a teaching tool for grade schoolers to help broaden participation in computer science education by providing an inclusive, interactive metaphor that naturally encourages algorithmic thinking. I was the artist on the game also part of the collaborative game design process on a team of seven which included undergraduates, a graduate student, and two professors. The game and metaphors went through many iterations during production and has continued on past my graduation.